Proposed rooftop additions for three former factory buildings at 515 through 521 West 26th Street in Chelsea. Image: Courtesy of Murdock Young Architects. Commissioners found additions’ visibility appropriate for Chelsea and the nearby High Line. On February 9, 2010, Landmarks approved 513 West 26th Street LLC’s proposal to construct rooftop additions on three, conjoined former factory buildings at 515 through 521 West 26th Street in the West Chelsea Historic District. The brick factory buildings, built between 1911 and 1921, vary in height from nine to three stories. The applicant’s original proposal, presented on October 20, 2009, included three rectangular additions partially concealed by raised parapets and set back ten feet from the front facade and flush with the rear facade. As originally proposed, the additions featured translucent, glazed curtain walls of fritted glass which would be visible from several vantage points, including the High Line. Shea Murdock, from Murdock Young Architects, argued that visible additions were appropriate for the location because there would be dialogue between the activity inside the glass structures and the activity on the High Line. Manhattan Community Board 4 opposed the proposal, citing the additions’ visibility and its use of glass. The Historic Districts Council’s Nadezhda Williams said the group objected to the unification of three distinct buildings with identical rooftop additions. The Commissioners reacted positively to the proposal and concurred that visible additions were appropriate for the district. The hearing closed without a vote after the Commission recommended design revisions, including further differentiating the additions, and asked the architect to provide samples of the glass to be used. At a subsequent hearing on January 12, 2010, Murdock introduced a honeycomb pattern to the exterior glass, which would now be opaque. The revised design staggered the additions to alter their lateral alignment. The revised additions would also set back from the rear facade, while remaining flush with side walls. The design included refacing two of the buildings’ three exposed brick sidewalls with a metal screen, and adding stucco in order to further distinguish the buildings. Commissioner Stephen Byrns found the proposal generally approvable, but recommended that the sidewalls be returned to brick. Chair Robert B. Tierney asked the applicants to work on the street-view visibility of the additions. At the February 9 hearing, Murdock presented the final plan. It included changing the additions’ facades to greenish glass with white fritting and lowering each of their heights from one to three feet. The buildings’ sidewalls remained faced with the varying materials. Commissioner Margery Perlmutter praised the project as being “a great approach to this historic district.” Commissioner Pablo Vengoechea supported the design, noting that it might be “crossing the line between architecture and sculpture.” Commissioner Diana Chapin said a “funky, art-industrial look” suited the district. Landmarks voted unanimously to approve the proposal. 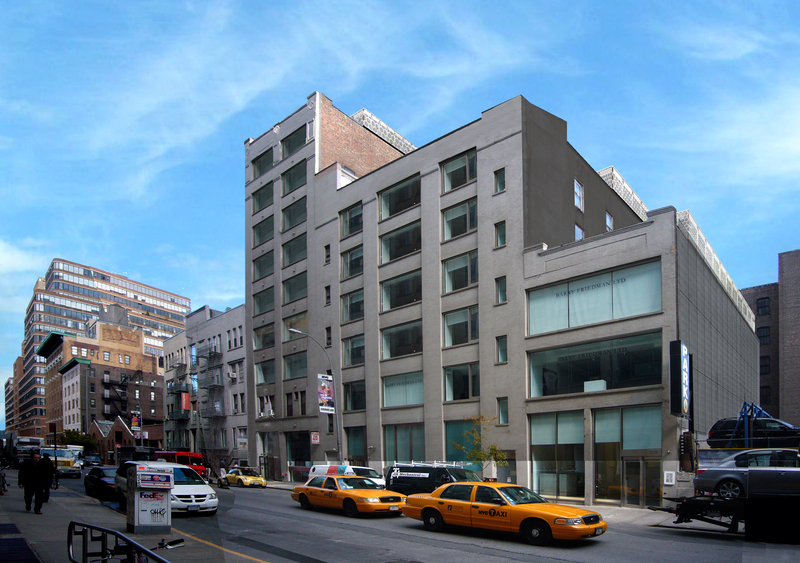 LPC: 515-521 West 26th Street, Manhattan (09-2511) (Feb. 9, 2010) (Architects: Murdock Young Architects).